LONDON, Ohio – As the list of new technologies used in the agriculture industry continues to grow, the use of unmanned aircraft systems (drones) has the potential to be among the most wide-ranging and beneficial for farmers, according to Farm Science Review organizers. To that end, farmers and growers can see daily demonstrations of an unmanned aerial vehicle or UAV during this year’s Farm Science Review Sept. 17-19 at the Molly Caren Agricultural Center in London, Ohio. The demonstrations will be the first time the Review has offered an up-close look at the technology in live action and is also the first time a farm show has offered field demonstrations of UAVs for agricultural use, said Chuck Gamble, who manages the Review. For more than 50 years, Farm Science Review field demonstrations have allowed farmers to go out and see farm equipment run side-by-side, Gamble said. So to be able to demonstrate to farmers how they can utilize unmanned aerial systems for real-time crop maintenance and precision management is a great opportunity, he said. An UAV prototype on display at last year's Farm Science Review introduced the concept to visitors. 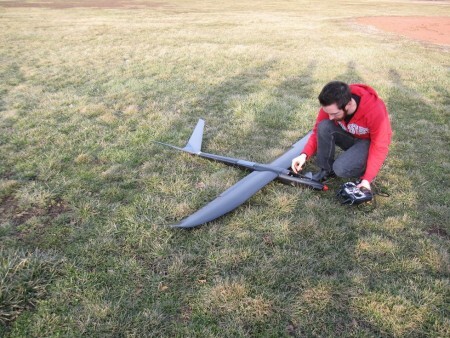 “I see amazing things that we can do in agriculture with UAVs,” Gamble said. “The UAVs can be used to provide useful local site-specific data, including crop scouting and geo-referencing to allow growers to monitor pesticide dispersion and fertilizer usage, and to monitor crop health parameters, including soil moisture. According to a March 2013 report by the Association for Unmanned Vehicle Systems International, the use of UAVs has the potential to generate $82 billion in economic activity between 2015 and 2025. The majority of the increased economic activity would be in agriculture, the Virginia-based trade organization said in its report. In Ohio, that increased activity will translate into 2,700 new jobs by 2025 and generate $2.1 billion in development, the report said. Among the many ways agriculture can use UAVs are in the areas of water management and water quality, which are very important issues for the agriculture industry, particularly in Ohio, Gamble said. “Drainage has always been a key component to proper crop development,” he said. “Such as how do we manage water and nutrients better, which has a major impact on yields. The Review is among a list of organizations nationwide that have been granted a special waiver or certificate of authorization by the Federal Aviation Administration to demonstrate the UAVs during the show, Gamble said. The demonstrations will take place daily at the Trotter Field Demonstrations from 2 to 3 p.m.
Field drainage, from 9 a.m. to 4 p.m.
Corn harvest, from 1 to 2:30 p.m.
Corn stalk baling and wrapping, from 1 to 2:30 p.m.
GPS technology/strip-till, from 1:30 to 3 p.m. Variable rate technology lime application, from 1:30 to 3 p.m. Manure application equipment, from 1:30 to 3 p.m.
Tillage equipment, including vertical tillage, from 1:30 to 3 p.m.
Stalk shredders, from 1:30 to 3 p.m. Soybean harvest, from 2 to 3:30 p.m. These field demonstrations are just a sampling of some of the opportunities participants can experience during the three-day farm trade show that annually draws more than 130,000 farmers, growers, producers and agricultural enthusiasts from across the U.S. and Canada. Sponsored by Ohio State University’s College of Food, Agricultural, and Environmental Sciences, the Review features educational workshops, presentations, demonstrations and educational opportunities delivered by experts from Ohio State University Extension and the Ohio Agricultural Research and Development Center, which are the outreach and research arms, respectively, of the college. Participants can peruse 4,000 product lines from 600 commercial exhibitors, and capitalize on educational opportunities from Ohio State and Purdue University specialists. Farm Science Review pre-show tickets are $7 at all OSU Extension county offices, many local agribusinesses, and also online at http://fsr.osu.edu/visitors/tickets. Tickets are $10 at the gate. Children 5 and younger are admitted free. Hours are 8 a.m. to 5 p.m. Sept. 17–18 and 8 a.m. to 4 p.m. Sept. 19.